David Meiswinkle, JD an Ex-Cop and Practicing Criminal Defense Attorney Investigating the Need for a Genuine Criminal Investigation of 9/11! We here at Quantum Matrix Radio want to wish our host, on this show and our former show Satyagraha 9/11 Radio, a very Happy New Year and a splendid life ahead! David is retiring from the show and we are so grateful for his amazing contribution. We look forward to having him on as a special guest in the future to hear about his ongoing work in bringing about greater clarity and truth concerning the important issues of our time. Thanks so much David and Happy New Year! This is an ENCORE broadcast! Today’s show is dedicated in loving memory of Robert C. Meiswinkle. David Meiswinkle is currently the host of Quantum Matrix Radio. He also recently completed an over 440 mile trek for truth and liberty, along with Quantum Matrix Radio producer Pamela Senzee. Together they are making a film about their adventure which includes numerous interviews with the people they encountered and with leaders in the truth, peace, and transformation movements. Their film is called Truth Walk! Mr. Meiswinkle is on the Board of Directors for the Lawyers Committee For 9/11 Inquiry and was a featured panelist at the unprecedented 9/11 Justice in Focus Conference. David has also traveled around the world, including a six and one half month hitchhiking and trekking adventure, while on leave from the police force, which took him through Australia, Japan, India and high into the Himalayas of Nepal. 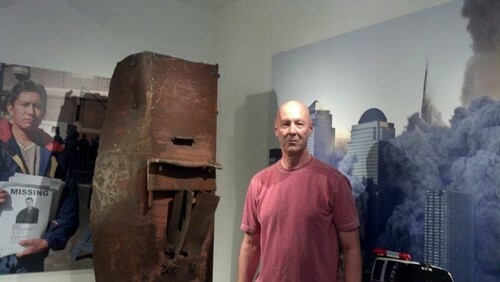 David is President and Founder of New Jersey 9/11 Aware an organization founded in order to educate the public of the need for a new, unbiased 9/11 investigation, and of the nexus of jurisdiction which the State of New Jersey has concerning the crimes of 9/11. He also a Board of Directors member of Lawyers For 9/11 Inquiry. This show was broadcast on January 2, 2017. This entry was posted on Sunday, January 1st, 2017 at 9:07 pm	and is filed under 9/11, Censorship-Propaganda, Education, False Flag/Fake Terror, Freedom, Justice, Law, News, Protest, Quantum. You can follow any responses to this entry through the RSS 2.0 feed.